Just built! This beautiful home was selected to be featured on an upcoming episode of HGTV's Hawaii Hunters. New construction on scenic Pukalani Drive. Custom built 3 bedroom 2 bathroom large post and pier 1, 232 sqft home on a 12, 000 sqft lot built 80 feet from pavement with split bedrooms and open concept plan featuring vaulted ceilings. This home features luxury vinyl floor through out, stained doors to compliment flooring, kitchen cabinets trimmed with stacked molding, tiled backsplash, quartz counter top, stainless steel appliances and a large pantry, indoor laundry room off kitchen with 2 linen closets for extra storage and Large master bedroom with quartz counter-top and double sinks. Enjoy the landscaped yard, circular driveway to a 18 x 24 carport with stained wood ceiling. 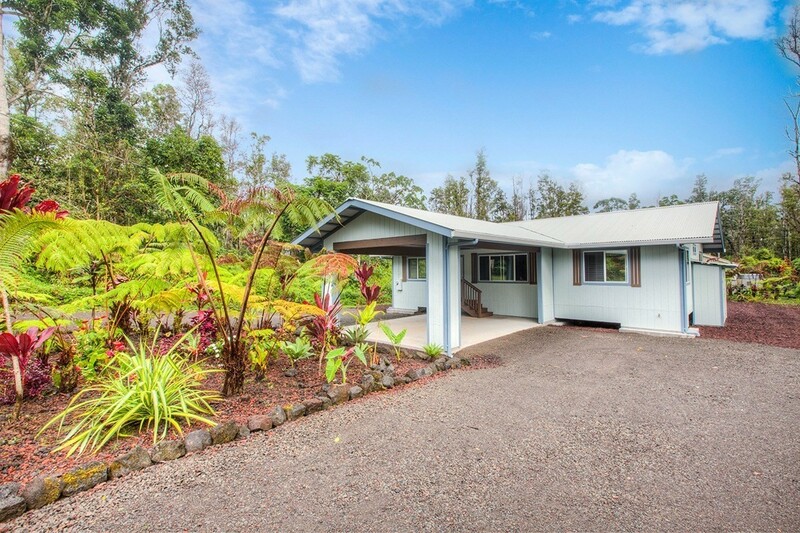 This is the most desirable area of Pahoa, Just a short drive to all conveniences of shopping, dining and entertainment in Pahoa or Keaau town or about 20 minutes to the Hilo International airport.